Discussion in 'Food Preparation, Camp Cooking and Recipes' started by drakeshooter, Nov 8, 2018. BTW, the sad haul so far with a pair of channel locks and a hammer. 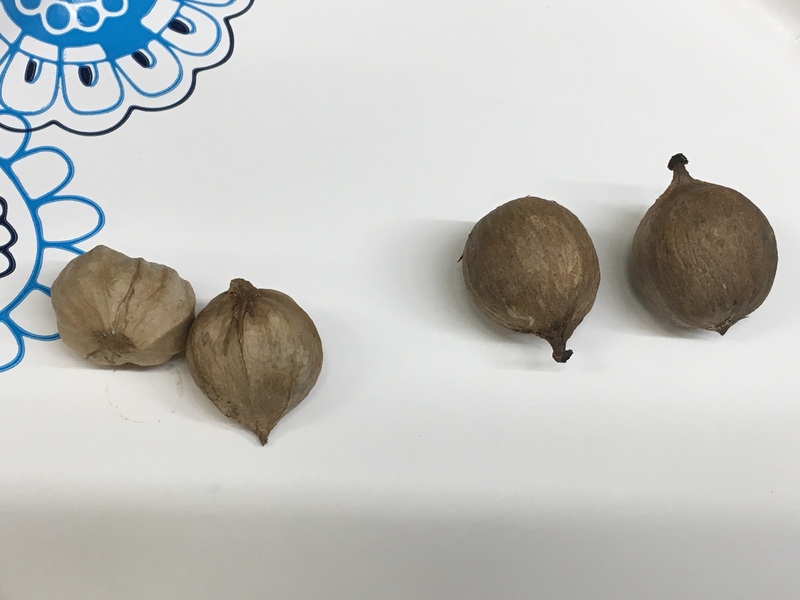 The nuts on the right look like mockernut hickory. 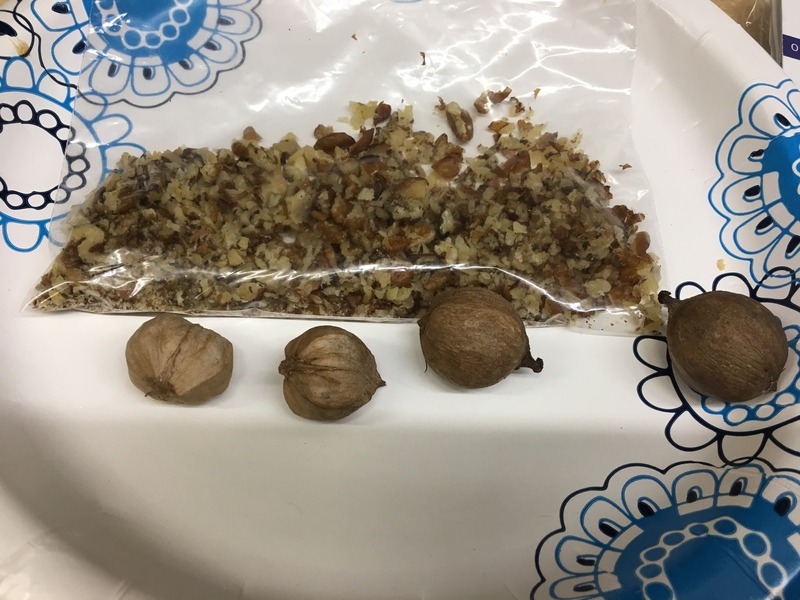 Working with two different hickory nuts. The two on the left are smaller and ridgier from a couple of 2’ plus ft diameter old shag bark of some kind hickory and the two on right are bigger, rounder and much harder nuts that come from a smooth bark hickory, this one old and 2’ plus too. Both contain a good deal of meat but I’d give the edge in taste to the shaggy. drakeshooter and barney like this. Drakeshooter I think the two on the right are what we call pignuts. I don't think you will like them. The squirrels on my place pass them by until all the shagbark nuts, walnuts, hackberries and all corn or bean crop residue is gone. They’re actually pretty dang good and full of meat. My mother was specialist in the hickory nut cake world. My dad in his late 70s in to early nineties picked at hickory nuts all fall. He had two special trees "out in the deep woods" where nobody else picked them up. When he really got up in years , I would gather bushel baskets of them when I got home to visit. It was like a Xmas present to them when that big basket of nuts would show up. Both complained that "now he has put us to work" but both of them worked hard at great food their whole ives , so a fall without hickory nut cakes would be a great failure to them. Dad would fill up gallon glass jars of picked nuts every fall. But he probably worked at it 5-6 hours a day for weeks. Not a pie related post , but the ingredient process is the same. Anybody else know the trick to get your hickory nuts spread evenly throughout the cake as opposed to all sinking to the bottom of the pan full of batter? I do. No but I’m all Ross Perot curious lol. Bees' post got me thinking about my Dad. He's 92 now and I'm his caregiver. Anyway, when he finally actually retired about 20 years ago he was constantly complaining about not having anything to do so I brought him 10 gallons of hulled hickory nuts and 5 grass sacks of unhulled walnuts. Told him he could pick them out on the halves if he wanted to. Kept him busy for quite a while. After he got them done he still complained to my Mom and sisters about not having anything to do but not a peep about it to me. Nock, Bee, carnivore and 4 others like this. Bee and drakeshooter like this.